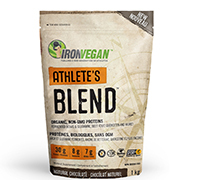 ATHLETE’S BLEND maintains our commitment to organic, non-GMO proteins and to all natural formulas that are certified vegan, kosher and gluten free, but it’s also designed to aggressively support the needs of the most ambitious athlete. If the goal is to enhance your athletic performance and to accelerate muscle cell repair after exercise, using the cleanest possible plant based ingredients, then ATHLETE’S BLEND is for you. ATHLETE’S BLEND was designed with the most ingredient conscious athlete in mind. Each serving provides 30 grams of organic, non-GMO plant based protein which supplies a complete range of essential amino acids and helps to build and repair body tissues. It also features 6 grams of added vegan L-Glutamine (to assist in muscle cell repair following exercise) along with a blend of fermented BCAAs. In combination with the naturally occurring amounts, each scoop delivers over 8 grams of L-Glutamine and a whopping 7 grams of vegan BCAAs. Last but not least, is an additional family of complementary ingredients that includes Taurine, Zinc, Beet Root and more. Best of all, ATHLETE’S BLEND delivers all of the above without compromise. Like all Iron Vegan products, it maintains its commitment to organic, non-GMO proteins and to all natural formulas that are certified vegan, kosher and gluten free. ATHLETE’S BLEND follows in the footsteps of our SPROUTED PROTEIN. Gone is the gritty, grainy mouth feel of a typical vegan protein. In its place is a smooth, delicious flavour and a creamy texture that will almost certainly surprise you. Non-Medicinal Ingredients (Chocolate): Organic Fair Trade Cocoa, Organic Chocolate and Vanilla Flavours, Apple Pectin, Xanthan Gum, Organic Stevia Leaf Extract, Sea Salt. 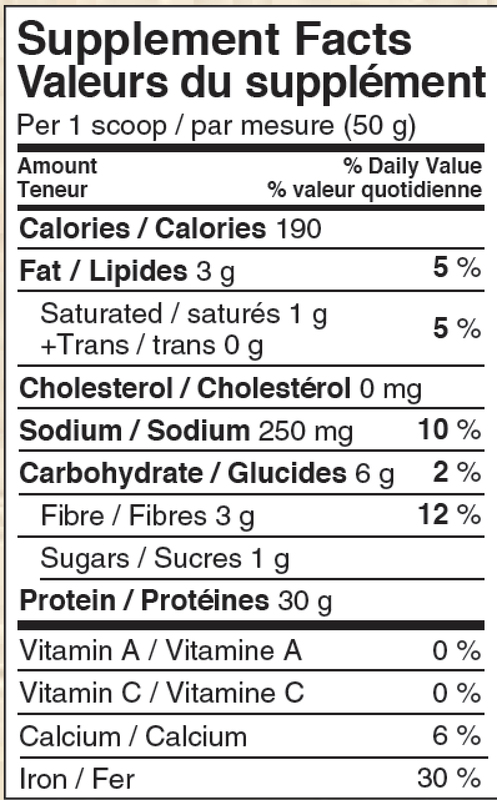 Non-Medicinal Ingredients (Vanilla): Organic Vanilla Flavours, Apple Pectin, Xanthan Gum, Organic Stevia Leaf Extract, Sea Salt.